Now this lady’s gotta be on top of the world right now… 1st the AMA’s “Lifetime Achievement Award” & NOW… Whitney’s celebrating the 25 yrs since the release of her debut album “Whitney Houston”! To help celebrate… word is the singer will be re-releasing her debut CD, re-worked & including 5 bonus tracks, a DVD featuring never before seen interviews & performances, 4 music videos… AND her ’85 TV debut on “The Merv Griffin Show”!!! YOU SURE RIGHT! After all the SH! @ Whitney’s been through… she better thank ALL the fans that have stuck around! Now I’ve heard of goin all out on your bday… BUT c’mon Diddy, did you really have to go ALL OUT!!!??? If you haven’t heard… for his 40th, the Bad Boy front man spent $3 million to throw his party last Thurs in NY! DANG!!! From what we heard… the event was themed out as “The Garden Of Eden”. It included a black custom dance floor, black custom chandeliers, a silver confetti drop… AND a performance from Al Green! Now he’s not just starring in it… HE WROTE IT! In a world where artists left & right owe the government… here’s a twist… THEY OWE DR DRE!!! According to TMZ.com… the California State Controller’s Office owes Dre $132.98 in back wages! THAT’S IT!??? Hahaha… We wonder if it’s even worth the trouble. What would you do? In the meantime… keep your fingers crossed for the Dr’s “Detox”. We’re hoping that he finally decides to release it so ALL us fans can finally check it out! Did you see the performance from Idol runner up Adam Lambert!? Well he surely wasn’t a winner! Now by now some of us already know that Wu Tang members Meth, Raekwon & Ghostface have gotten together to make a new album… NOW it looks like another member of the clan wants to join in on all the fun! 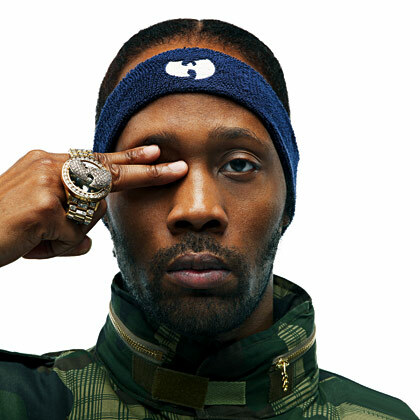 WOTS… RZA loves the idea so much he’s gonna try to make himself a part of the project!!! Hmmm… I wonder if there’s some bad blood? WHAT DO YOU THINK!? KANYE’S SHORT FILM… SHORT LIVED! Fans of Kanye West were given an online treat… only to be taken away! LUCKY FOR US!!! You can check out the video right here… You better hurry though, you know they’ll end up pulling this one as well! ENJOY!! Speaking of Ne Yo… having worked on the album, the singer/songwriter & producer says the world needs to get ready for a Rihanna that has things to say! Now I’ve heard of “regular” people deleting their online profile pages because their “significant others” wanted them to… but celebrities!?? Well its true! Word is Miley Cyrus has tweeted her last message on Twitter… all because her boyfriend, actor Liam Hemsworth, wanted her to! WOW!!! Now I wonder if the rest of the market will follow her… PROLLY NOT! Love is in the air AGAIN in MTV land! WOTS… Nick Lachey & Vanessa Minnillo are back together! After the two called it quits earlier this yr in June… the couple have rekindled their flame & have even been seen in public mugging down! It’s official!!! Katy Perry & Russell Brand have made their relationship public… FINALLY! TAKE THAT ! ! ! DEAD CELEBRITIES ON SOUTH PARK!? You read correctly… the 13th season of the cult classic “South Park” promises to be an interesting one. Especially since they will be paying homage to our passed celebrities! IT TRULY IS THE ERA OF REMAKES!!! WOTS… New Line Cinema is in talks of bringing back our favorite 80’s family “The Griswolds”!!! Til then… SEE YOU @ THE MOVIES ! ! ! Looks like a Knowles is in the spotlight again… BUT this time is Matthew! WOTS… Beyonce & Solange’s dad is facing a paternity suit from an actress who claims she is PREGO!!! Oh yea… Alexsandria Wright says that she is 6 monts pregnant w/ Mr Knowles child! WOTS… Raphael Saadiq will be venturing off on a North American tour, stopping by 20 cities!!! Looks like the end of the yr is gonna be busy w/ some great tours!! !